Beef, soy sauce, water, brown sugar, liquid smoke, spices. The first flavors to hit the palate are a sweetness combined with the smoke flavor. Some spicy tingle starts up, and then there's a tomatoey flavor. I can also pick up faint chile pepper tastes, and a very faint chipotle. Going into the chewing, touches of natural meat flavor and shades of soy sauce come in. For being marketed as a barbecue flavored jerky, it seems to hold up well. This has the thick sweetness you expect in a barbecue style, along with the bold, spicy seasonings. But it also has that tomatoey sauce flavor, and a tanginess too. As for the spiciness, there's definitely some heat in this. I'd rank it as medium on my personal heat scale (level 3 out of 5). 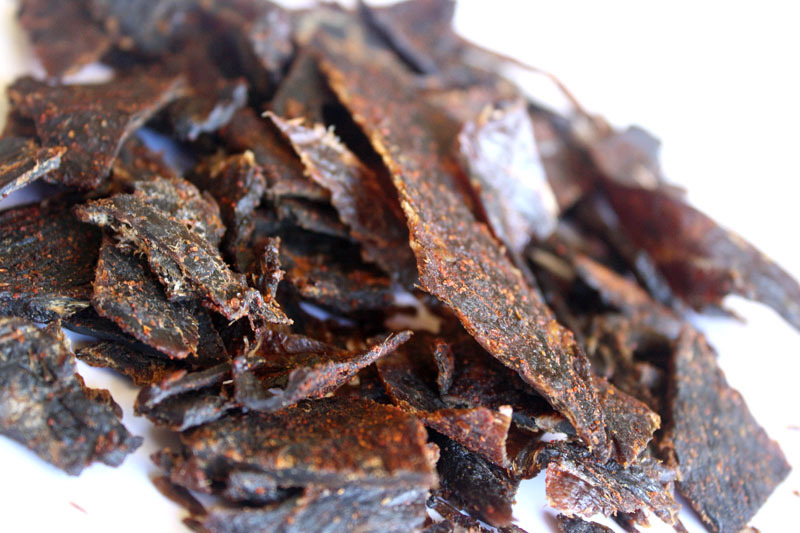 Overall, the flavors that seem to define this jerky pretty much sums up as a bold, spicy, sweet, tomatoey, "barbecue sauce", but with an emphasis on the characteristics of chile peppers and chipotle. The meat consistency is very meaty. I find very few stinginess, very little fat, or other unchewable tissies. It's chewy, but still manages to be easy to eat. Once chewed down, it feels just eating a piece of steak, like something cooked well. 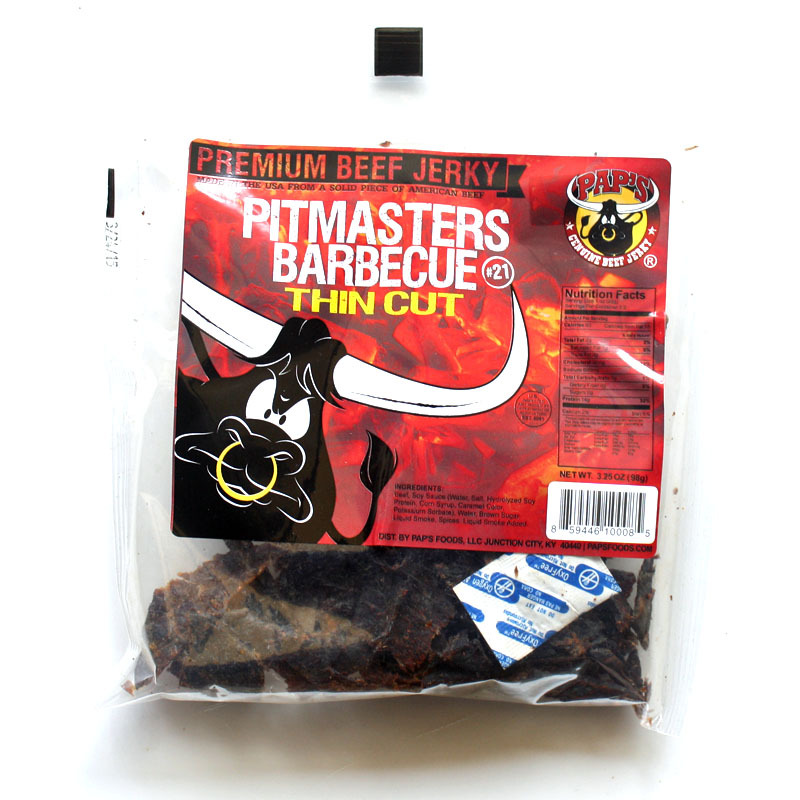 Verdict: This Pitmasters Barbecue #21 from Pap's Beef Jerky really gives out a good "wow factor" the moment you put a piece into your mouth. It's like a combination of thick Kansas City-style sweet, a bold Memphis-style seasoning rub, and the spicy Louisiana-style heat. 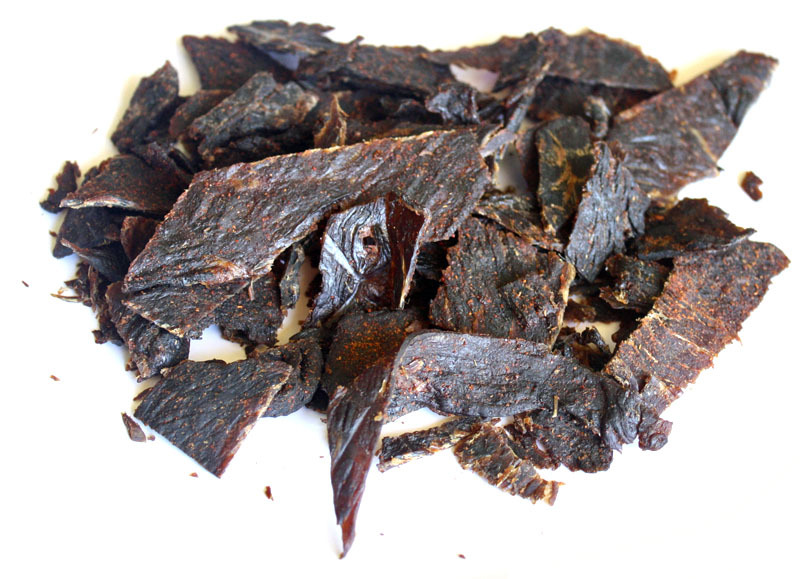 The thin cut, Kentucky style beef jerky creates some added snackability for its ease of eating, along with the smaller, bite-sized pieces.